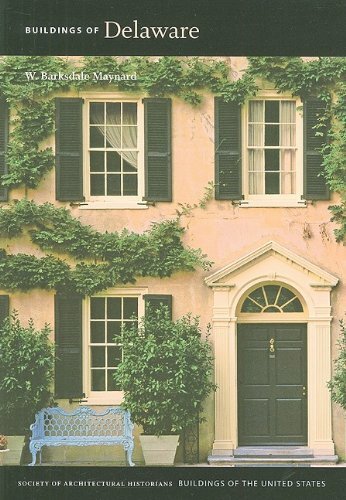 The latest volume in the Society of Architectural Historians' prestigious Buildings of the United States series, Buildings of Delaware is the first book to document the state's architectural history from all periods. Extensively illustrated with photographs and maps, and supplemented by a glossary and bibliography, the volume covers buildings of many styles, types, and materials, from grand mansions to vernacular structures, and from urban to rural settings. The noted architectural historian W. Barksdale Maynard spent much of 2002 through 2004 canvassing the rich cultural heritage of the state and investigating its relationship to the built environment--from an ancient Dutch dyke of 1660 to a cutting-edge cable-stay bridge recently completed, from colonial smokehouses in the countryside of Kent County to a rare, intact, International Style 1940s elementary school in the city of Wilmington. Among the architectural forms discussed are industrial and agricultural buildings and structures that characterize the state's rivers, canals, and shoreline, from gristmills to bridges and lighthouses. Major cities such as Newark and Wilmington are considered at length, with entries on homes, churches, schools, and government buildings, and the state's natural landscape, parks, and such renowned gardens as Winterthur are also described. Buildings of Delaware will provide scholars with valuable information on the architecture of the state, and will spark the imagination of general readers and local historians as well. W. Barksdale Maynard, Lecturer in the art history departments at Johns Hopkins and Princeton, is the author of Walden Pond: A History, Architecture in the United States, 1800-1850, and Woodrow Wilson: The Battle of Princeton and the Making of an American President.